FREE! Valentine’s Day Patterns and Skip Counting. 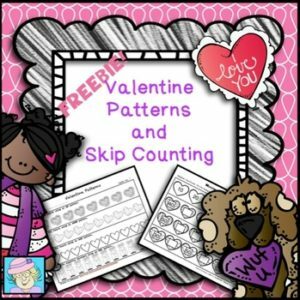 Your littles will enjoy celebrating Valentine’s Day AND processing pattens and skip counting with this 5-page FREEBIE! It includes 2 pages of pattern coloring and 3 pages of skip counting. Students will color the Valentine’s Day items in patterns such as AB, AABB, ABC, and more. They will fill in the blanks to skip count by 2s, 5s, and 10s.